If you like this cowl and want to make it, please work hard to find the Amelie yarn! It is amazingly soft and fluffy and luscious! The yarn construction is a silk sheath with the alpaca and merino blown in so it performs well on a larger needle. If you decide to use a different yarn, go more for a Bulky rather than Aran weight. But really, find this yarn! 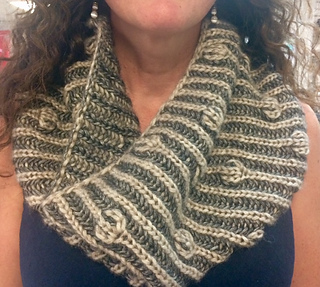 The cowl is knit in the round in two color brioche. This is a pretty easy brioche pattern and it is both charted and written. There is one increase and one decrease that are used over and over again. If you are newer to brioche, I have a couple of YouTube videos that might be helpful.